Election is a strange word when used in theology. It brings to mind old debates about what God might or might not have done before the foundation of the world. But viewed apart from that historical baggage, the word 'election' is about a central gospel idea: that in Jesus not only does God choose to be God for us but chooses us to be for God. The calling of the disciples in the Gospels is a story of election, of how God chooses to transform the world by choosing us to be messengers and agents of that transformation. So it is, says William Willimon, that election becomes not just the content of our preaching but the means as well. God chooses preachers. How unlikely—how odd—is it that God should entrust the proclamation of the gospel to, well, us? This unpredictable, electing God reaches out to save the world and then leaves it in the hands of preachers to get the word out? Through us, through our stammering tongues and faltering hearts, the preached word becomes the Word of God. If you wonder why you drag yourself into the pulpit every Sunday, if you worry that your sermons aren't reaching past the front pew, then read this book and be encouraged. God chooses; God chooses preachers; God chooses you. "Most preachers don't read Karl Barth once they've finished seminary. Proof of Will Willimon's oddness can be found in that he's still reading Barth, even all these years later. For this we should be thankful, for Willimon's close and faithful reading of Barth's doctrine of election from his perch at the end of a career gives perspective that we often lack in today's church culture—those who preach are elected to preach. Elected by God. So hold your head high, Willimon says, and preach the truth." —Tony Jones, author of Did God Kill Jesus? "William Willimon has long since established himself as one of the premiere preachers of our time. 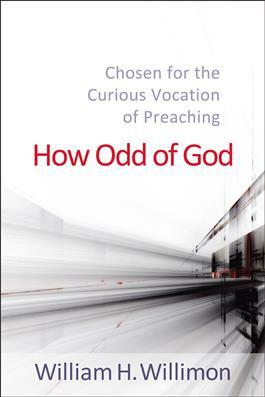 In this new book he shows how strong preaching is impossible without strong theology to undergird it. This is a masterful text to be studied and savored by all who care about the renewal of theology and preaching in today's church." "'How Odd of God'. . . to combine the gifts of leadership, prophecy, theology, and wit in one southern preacher. But in Will Willimon the deed is done. In this rich study, Willimon emerges not only as an insightful (or is it inciteful?) preacher, but also as one of our foremost theologians of preaching. Looking through the keyhole of Barth's theology of election, he sees the whole glorious world of Israel, the church and our calling to be followers of Jesus. Although this is not a how-to-do-it book, Willimon's congenital habit of telling the truth provides the best preaching model of all." "If Will Willimon had merely rendered the vexed and neglected Christian doctrine of election clear and accessible, that would have been contribution enough. But in this thoughtful and sustained conversation with theologian Karl Barth, Willimon has accomplished far more. He has made the doctrine of election fascinating, even urgent. Election, as he presents it, is a refreshing and revolutionary word, first to timid preachers that we are not charged with coming up with words about God, but instead 'God has come up with words for us,' and then to an over-confident and self-actualized culture that we are not as in control as we imagine, that, indeed, we can have hope only 'because our lives are not our own.'" "Karl Barth once wrote that, for us moderns, theology cannot be re-established except with audacity. That is a good description of Will Willimon's writing-he is audacious (or with a Southern inflection, bodacious). He is never afraid to offend us, or make us cry, or laugh. He cuts through our defenses for the gospel's sake. How odd of God to choose Willimon to be a messenger on behalf of Jesus Christ. Yet how wonderful of God to do so."